Kandy is a quaint town amidst the cooling climes of the island with a rich heritage and legendary tales to reveal to the traveller. 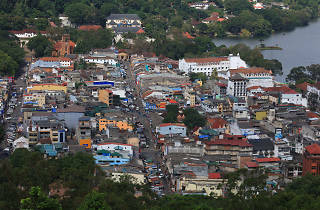 Kandy, being the cultural capital of the island is one of the destinations of the cultural triangle and thus many significant features including its unique architecture. The bustling town coupled with royal heritage and legendary sagas attract the visitor with vivid sightings and scenic locations. Continuing to preserve the capital’s heritage, Kandy is a must see destination when visiting Sri Lanka. The majestic complexes and illustrious monuments resemble the epitome of the Kandyan era. Of the many remarkable sites is the revered Sri Dalada Maligawa, which hosts it annual Esala Perahera in August The Pulsating beat of the esala perahera. 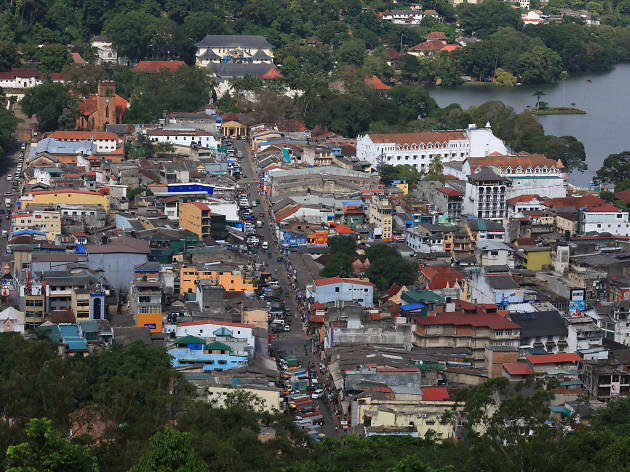 Kandy is renowned for its several cultural and religious sites and attracts large crowds all year round. We recommend many fabulous things to do while in Kandy. Immerse in mesmeric views of the cool climes wafting with mist in the early morning hours. The hill country is a truly charming destination with many historical accounts to explore. The impressive stretch of 147-acre is occupied with verdant flora. Well pruned walkway provides a sense of peace and relaxation as one walks through the garden. The scenes of fresh green trees tended branch out to several categories in the surroundings. The Great Lawn is where families are seen gathered for a picnic enveloped in the love of nature. One of the largest botanical gardens featuring over 4000 species is also home to a collection of 300 species of orchids. Of the many species found are the Giant Bamboo of Burma, the century old giant Javan Fig Tree, the Cannonball tree and exotic range of palms. The Sri Dalada Maligawa illuminated during the elaborate Kandy Esala Perahera – a much awaited festival of the year – is truly a marvel. The perahera transforms Kandy into a spectacular site with vibrant decors and rituals. See feature on The pulsating beat of the Esala Perahera. The man-made lake built during the reign of the last king of Kandy offers boat rides. The tranquil lake at the heart of the town is a landmark of the hill capital offering impressive views. Take a walk around the beautiful lake, affectionately called Kiri Muhuda (Sea of Milk), or feed the fish that has made the lake their home. Believed to have been built by King Wickramabahu III, the Embekke Devale has a fascinating legend attached to its origins. Devoted for the worship of Kataragama Deviyo, Embekke has many elaborately carved pillars that support the structure. The roof at Embekke was erected without a central beam; instead, 26 rafts meet at the centre of the roof, connected by a single wooden nail. The tallest Buddha statue in a seated posture that built on Bahirawakanda can be viewed from many places in Kandy. The pristine white statue of the Buddha is 88ft in height. Visitors can reach the hill top and immerse in breath-taking views of the entire city of Kandy. House of Fashions is back on Duplication Road!